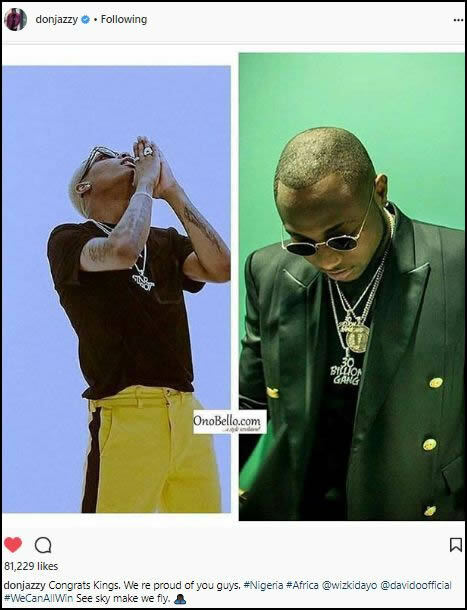 Following the historic win of Nigeria’s superstar musicians Wizkid and Davido at the just concluded MOBO awards, many top politicians and celebrities have congratulated them. The latest celebrity to do so is Mavin boss, Donjazzy who sent a congratulatory message to both stars via his Instagram page. Just as BankyW declared that there was enough space in the sky for them to shine together, Donjazzy also called them kings and declared that they could win together while congratulating them.